This is the seventh post in a multi-part series about how you can perform complex streaming analytics using Apache Spark and Structured Streaming. Most data streams, though continuous in flow, have discrete events within streams, each marked by a timestamp when an event transpired. As a consequence, this idea of “event-time” is central to how Structured Streaming APIs are fashioned for event-time processing—and the functionality they offer to process these discrete events. The API to instruct Structured Streaming to drop duplicates is as simple as all other APIs we have shown so far in our blogs and documentation. Using the API, you can declare arbitrarily columns on which to drop duplicates—for example, user_id and timestamp. An entry with same timestamp and user_id is marked as duplicate and dropped, but the same entry with two different timestamps is not. Let’s see an example how we can use the simple API to drop duplicates. Over the course of the query, if you were to issue a SQL query, you will get an accurate results, with all duplicates dropped. 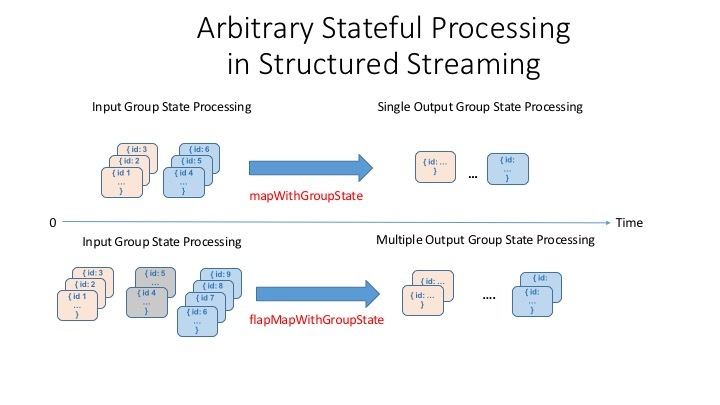 Next, we will expand on how to implement a customized stateful processing using two Structured Streaming APIs. Not all event-time based processing is equal or as simple as aggregating a specific data column within an event. Others events are more complex; they require processing by rows of events ascribed to a group; and they only make sense when processed in their entirety by emitting either a single result or multiple rows of results, depending on your use cases. 2. We want to maintain user sessions, over definite or indefinite time and persist those sessions for post analysis. All of the above scenarios require customized processing. Structured Streaming APIs offer a set of APIs to handle these cases: mapGroupsWithState and flatMapGroupsWithState. mapGroupsWithState can operate on groups and output only a single result row for each group, whereas flatMapGroupsWithState can emit a single row or multiple rows of results per group. One thing to note is that because we manage the state of the group based on user-defined concepts, as expressed above for the use-cases, the semantics of watermark (expiring or discarding an event) may not always apply here. Instead, we have to specify an appropriate timeout ourselves. Timeout dictates how long we should wait before timing out some intermediate state. Timeouts can either be based on processing time (GroupStateTimeout.ProcessingTimeTimeout) or event time (GroupStateTimeout.EventTimeTimeout). When using timeouts, you can check for timeout first before processing the values by checking the flag state.hasTimedOut. To set event time timeout, use GroupState.setTimeoutTimestamp(...). Only for timeouts based on event time must you specify watermark. As such all events in the group older than watermark will be filtered out, and the timeout will occur when the watermark has advanced beyond the set timestamp. When timeouts occur, your function supplied in the streaming query will be invoked with arguments: the key by which you keep the state; an iterator rows of input, and an old state. The example with mapGroupsWithState below defines a number of functional classes and objects used. Let’s take a simple example where we want to find out when (timestamp) a user performed his or her first and last activity in a given dataset in a stream. In this case, we will group on (or map on) on a user key and activity key combination. 1. Three class definitions: an input definition, a state definition, and optionally an output definition. 2. An update function based on a key, an iterator of events, and a previous state. 3. A timeout parameter as described above. So let’s define our input, output, and state data structure definitions. And finally, we write our function that defines the way state is updated based on an epoch of rows. With these pieces in place, we can now use them in our query. As discussed above, we have to specify our timeout so that the method can timeout a given group’s state and we can control what should be done with the state when no update is received after a timeout. For this illustration, we will maintain state indefinitely. In this blog, we expanded on two additional functionalities and APIs for advanced streaming analytics. The first allows removing duplicates bounded by a watermark. With the second, you can implement customized stateful aggregations, beyond event-time basics and event-time processing. Through an example using mapGroupsWithState APIs, we demonstrated how you can implement your customized stateful aggregation for events whose processing semantics can be defined not only by timeout but also by user semantics and business logic. Our next blog in this series, we will explore advanced aspects of flatMapGroupsWithState use cases, as will be discussed at the Spark Summit EU, in Dublin, in a deep dive session on Structured Streaming. Try Apache Spark’s Structured Streaming latest APIs on Databricks’ Unified Analytics Platform.